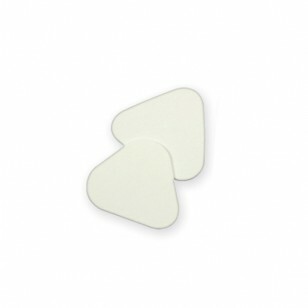 A thin, absorbent, cellulose triangle, the Dri-Angle comes in two types: plain and silver coated. Use the silver coated Dri-Angle for superior saliva control. Silver coating on one side acts as a complete moisture barrier for heavy salivators. The Dri-Angle is a unique replacement and a decided improvement on the cotton roll in the parotid area. The Dri-Angle covers the parotid or Stensen's duct and effectively restricts the flow of saliva.